Wicked Wednesday – We Scream for Ice Cream! It’s summer. It’s hot. A writer’s thoughts turn to ice cream. Don’t yours? Even the most calorie-counting among us, or the lactose intolerant, or the head-down working-hard — we all want something sweet and cold on a summer evening. There’s full-fat ice cream dripping off a cone. There’s non-dairy Italian ice made with fresh raspberries. And the whole range in between. What’s your choice? Your can’t-live-without flavor? The flavor you hate? And where’s your favorite local place to get it? Edith: I happen to live a mile away from the best ice cream stand in New England. 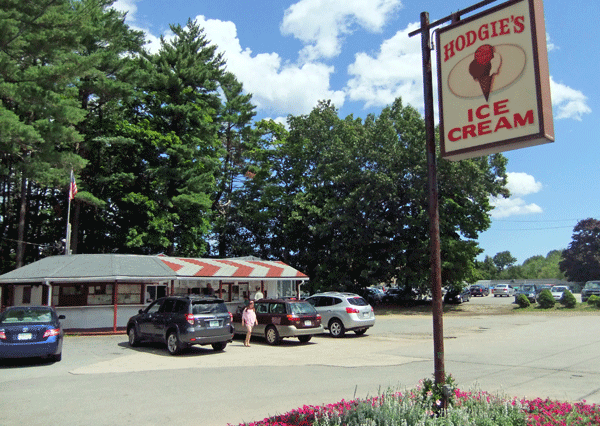 Hodgies in Amesbury, Massachusetts. Anyone will tell you so! They make the ice cream fresh on the premises every day. It is creamy, full-fat, and absolutely dreamy. You have to be careful not to order a “Small” size cone, though. You get a mountain! A quarter “Kiddy” size is even a lot. My favorite flavor? Whatever their most chocolately triple chocolate is. Although I’ve also been known to devour a nice lemon sherbet, too. My least favorite flavor has either almond flavoring or coconut flavoring (although I love actual almonds and actual fresh coconut), and I don’t care much for frozen yogurt, either. Sherry: I can see we are going to have to agree to disagree here. 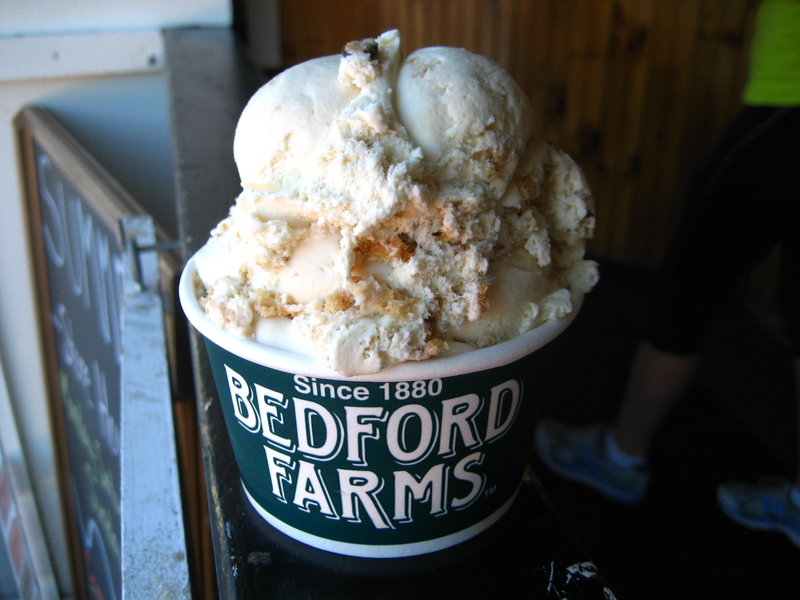 Because I know for a fact the best ice cream place on the planet is Bedford Farms Ice Cream in Bedford, Massachusetts. My favorite is Almond Joy and their kiddie size is gigantic too. Alas, I now live far, far away and haven’t found a ice cream stand other than chains in Northern Virginia. My least favorite flavor is anything with cherries. I’m not sure why — I love to eat fresh cherries but somehow they don’t translate well to ice cream! Jessie: Best ice cream place is Beak’s in Milton, N.H. right next to the town beach. It’s in New England so, of course, the portions are outrageous and the list of flavors is extensive. Everyone in town calls it The Pink Place because of the color of the building. The staff is friendly and always makes you feel welcome. My absolute favorite is Peppermint Stick. Sometimes I order something else like Peanut Butter or Lemon Meringue Pie but I always wish I had chosen Peppermint Stick instead. My least favorite? I guess I can’t split a pint with Edith! I absolutely despise chocolate ice cream. I can’t stand any kind of chocolatey bits in other ice creams either. 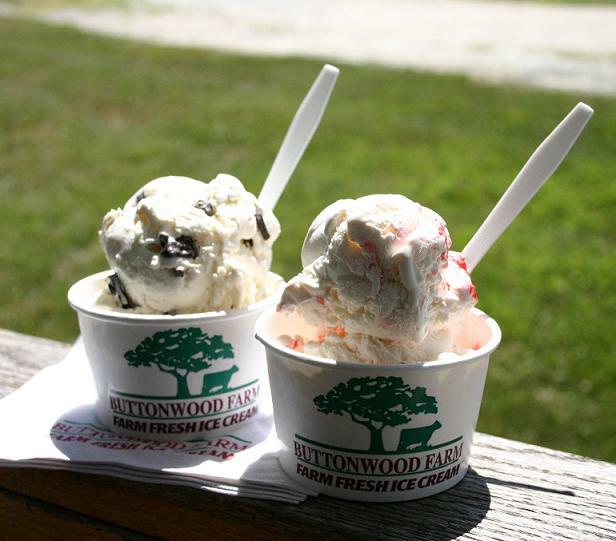 Liz: Here in Connecticut, the place that has kept me going for the past few years on the ice cream front is Buttonwood Farm in Griswold. It happens to be conveniently located on the way to the beach in Middletown, Rhode Island, where most summers are spent. Therefore, a trip here was pretty much a required part of the day. The ice cream is homemade, the lines are always long and the flavors are plentiful. There is also a magical ten days during the summer when the sunflowers grow in the fields and the farm offers tours and bunches to buy. Proceeds benefit Make-a-Wish foundation and the flowers are gorgeous. But back to ice cream – Jessie, no chocolate?? Not even chocolate bits?? You’re killing me! I can’t possibly pick just one – I love graham cracker, coffee mocha crunch, forbidden silk chocolate and pumpkin. My least favorite? Orange pineapple doesn’t do anything for me. I like my fruit in smoothies. When I want ice cream, bring the chocolate on! Barb: Well, I guess it takes all kinds to make the world. Edith, my current favorite flavor is anything with coconut. I cannot get enough. My least favorite is coffee–though I love actual coffee, so that continues a theme. Like almost all New Englanders, I love real, full cream ice cream. Lots of people assert that New England has the highest per capita consumption of ice cream, though it’s a matter of some dispute. Since we can’t eat ice cream every day (much though we would love to), I turn to Arctic Zero to keep the consumption somewhat in check. At 150 calories a pint, with no artificial sweeteners, it’s not ice cream, but I call it my methadone. Julie: I adore ice cream. Liz, I am with Jessie on the chocolate ice cream–but not on the chocolate bits. And Barb, hoping Whole Foods has Arctic Zero. Bedford Farms is great, and I look forward to trying the other two suggestions. I love JP Licks, Christina’s (way too close to my house), and Emack & Bolios. And down the Cape–Somerset Creamery in Catamut (get the Cranberry Bog and thank me later). But my favorite? Dairy Queen. Vanilla. With a butterscotch dip. I suspect there are two reasons for that. First, it is delish. 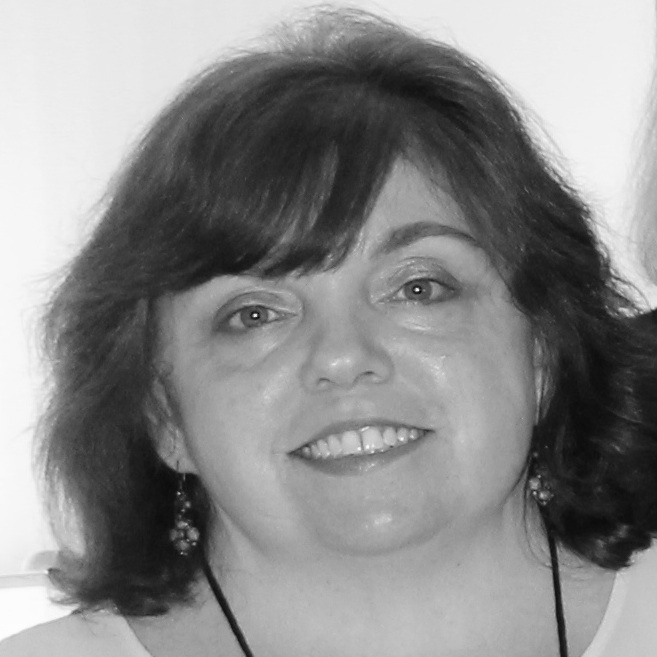 Second, I can only get it when I am on vacation with family–in Dewey Beach Delaware, or Falmouth Massachusetts. I think there is on in OOB as well. So it has a fun component to it as well. Is there an ice cream parlor series? Hhhmmm…. Readers, tell us your choice. Your can’t-live-without flavor?.The flavor you hate. Where’s your favorite local place to get it? And – have you ever read a mystery where the poison was in the ice cream? Lobster ice cream?? You are a brave soul. I will have to search out Ben and Bill’s next time I am in either place. And hazelnut gelato? YUM. As much as I love lobster I don’t think I could eat lobster ice cream! Gelato! That’s a whole post in and of itself. Bedford Farms and Kimball Farms for ice cream in MA, Morse Farm in Montpelier, VT has THE best Maple Creme around and is a Maple House during maple season. They also grow and sell pick your own berries (it’s blueberry season here), and our local Dairy Creme in Montpelier is amazing. You can’t beat the size of the Cremes or the price or flavor!!!! They have daily flavors and then a standard selection, as well as Dish of Dirt and the best fries around! Thanks for stopping by and contributing, Kelly! I’ve been to Kimball Farms and agree. Morse Farm sounds amazing! I wish I was back in New England to go. And I’ve heard how great Kimball Farms was but in the five years I lived in the Bedford area I never made it. Making ice cream in an old fashioned wooden churn is my new favorite cooking adventure. My latest success was Strawberry and my next challenge is Chocolate Chip Mint. The strangest ice cream I’ve ever tried was Green Tea flavored in Taiwan. It was delicious but weird. Great topic. How long does it take you to make ice cream in a wooden churn? Strawberry would be one of my favorites too! Oh, I forgot all about homemade ice cream. We used to make it when I was a child. Best vanilla ever, and sometimes we’d add homegrown peaches. To die for! And worth all the salt and grinding. Thanks, Cheryl! We’ve made ice cream, too. Both when I was a kid and with our own children. You’re right. It is unrivaled. Gray’s Ice Cream in Tiverton or The Daily Scoop in Barrington would get my vote for the best in Rhode Island. Lately though, I’ve been making my own. The family favorite at the moment is one made with Guinness (yes, Guinness) that is amazing. But I like humble, soft serve, watermelon sherbet which I can get at almost any ice cream stand. So refreshing in this heat we have been having. Guinness ice cream — oh my husband would love some of that! Bart’s Ice Cream in Amherst, MA. My favorite flavor is “3 Geeks and a Redhead:” coconut ice cream, coconut flakes, semisweet chocolate chunks, fudge brownies, with a red raspberry swirl. My other favorite flavors are Orange Dutch Chocolate and Chunky Chocolate Mousse with Raspberry. Now you ladies have me wanting an ice cream for breakfast! Benson’s homemade (with fresh berries) Black Raspberry Ice Cream in Boxford, MA. My favorite is peppermint stick. Used to go to Treadwell’s in North Andover and Hailey’s in Newburyport. My daughter worked at Hailey’s and would sometimes bring a bit of peppermint stick home (freshly made). Hodgie’s and Hodgie’s 2 are excellent as well. Anyone remember Sid White’s in Andover? Now that I live in Northern Virginia it is hardly worth eating ice cream! I so miss all of the wonderful places in New England.